Ever since I started working on the post related to the Japanese servers during the devastating earthquake and tsunami, my thoughts have been turning to the surprising fact that the Japanese work until midnight as you can see from this graph. It does not mean that Europeans are not hardworking, and yet I could not imagine people in the UK working from 9 to 24. The question about proverbial differences between the Japanese and English work habits intrigued me to the point that I decided to seriously look into the matter. What I found was interesting and somehow contradictory, especially when comparing the use of remote desktop support software in both countries. I am sure that many people have an image of the Japanese working environment giving more or less lifetime-employment but on the other hand demanding long working hours and unstinting devotion to one’s company. According to OECD’s employment outlook 2010, if we compare average annual hours of the two countries, Japan today doesn’t really stand out as a person might expect. Although the number was extremely high in 1979 -2,126, average annual hours in Japan have been persistently dropping during the last three decades. In 2009, an average worker did 1,714 hours, which is only 68 more than in the UK. Then again, there is a slightly larger discrepancy in the number of days of paid vacation that an average worker is entitled to – 28 days in the UK compared to the modest 15 days in Japan. Even so, an average Japanese worker takes only 7 days of paid vacation. 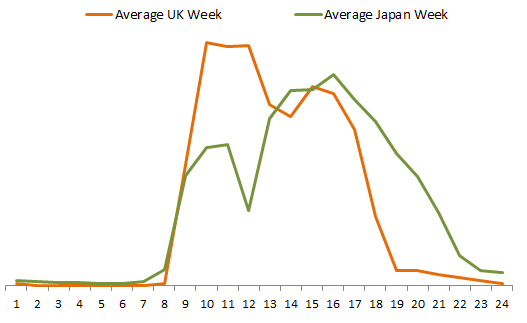 Similarities in the number of average annual hours between Japan and the UK nonwithstanding, I was interested in how ISL Online remote desktop support users behave in both countries. Remote support sessions, which are hosted on the ISL Online’s global cloud computing based network, follow a pretty similar trend during the weekdays; not many users are active during the night, but start at around 8 or 9 in the morning. Whereas UK users create more remote desktop support sessions before lunch and then slow down a bit afterwards until finally ending their work sometime between 17 and 18, the Japanese support more after their lunch break and then gradually stop working sometime between 17 and 22. Weekends, on the other hand, are a completely different story. 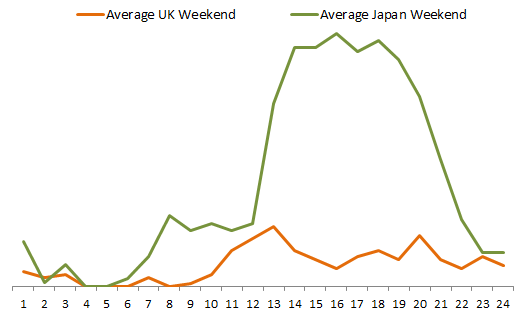 Although people in the UK show some activity on sacred Saturdays and Sundays, the Japanese work a lot more, i.e. from around 12 to 22. Let us look into Alan Macfarlane’s paper to find the explanation of the evident differences in the attitudes to work between the two. According to Macfarlane, the great difference between the Japanese and European traditions lies really in the mix of the motives to work. In Europe, there is deep ambivalence toward work; it is in a way sacrifice. In Japanese culture, since work largely arises from a need to communicate and express views in relation to others, it is often regarded as rewarding, strenuous but pleasant, like a sort of game. Where the two traditions meet as is the case here, work is valued and endless. It is symbolically as well as instrumentally important. It is an expression of a person’s identity as well as a means of acquiring wealth. Work as a source of self-esteem is essential to every human being, evidently even more so to the Japanese. This entry was posted in isl online, remote desktop support, Uncategorized and tagged attitude to work, comparison uk and japan, japan work, remote desktop, remote desktop support, remote support, uk work, work habits, work hours. Bookmark the permalink.